Claire Lynsey Rubini danced in this world from May 24, 1990 to July 6, 2000. During the short ten years she was with us, she delighted all with her impish ways, her big smile, her creativity and her feisty spirit. The oldest of Brad and Julie Rubini’s three children, she took her role of big sister seriously. She enjoyed telling her siblings what to do, and was always concocting fun games to play whether outside basking in the sun, or inside on a rainy day. Claire was tall and thin, and according to a childhood friend, “had great hair”. True to her colorful flair, she would often fill her light brown locks with a variety of barrettes and pony tails. She loved to dance, sing loudly, play with friends, and tried her best at softball (getting her first hit the summer before she passed away). Claire also liked to swim, and told the best stories to anyone who would take the time to listen. Her younger sister Kyle was always in tow, and she often picked fights with her younger brother Ian. Claire loved her family’s camping adventures and traveling to different states. She enjoyed family reunions, and loved her cousins, aunts, uncles and grandparents. Her favorite color was purple and her favorite homemade meal was her mom’s “pesto pasta”. Claire loved her teachers at Fort Miami elementary in Maumee, as they loved her. Always responsible, she was thrilled to have been chosen to be a captain of the safety crossing guards during what was to be her fifth grade year. She was involved in scouting activities from an early age, and played the violin, although she didn’t like practicing! She had a passion for reading from a young age, fueled by weekly trips to the library. Her little bag would sag from the number of books she brought home to enjoy. Claire would often try to get out of chores due to being caught up in a book, and sometimes ate dinner a little late so that she could read “just one more page”. 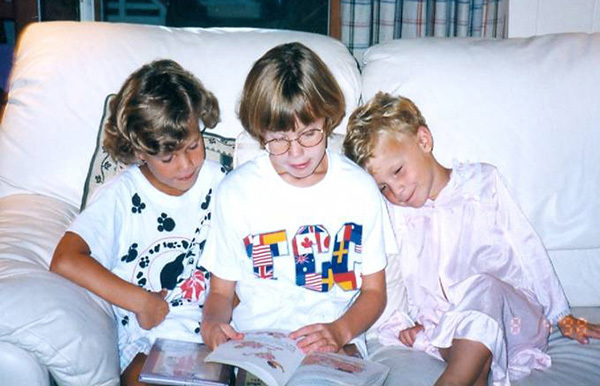 She often read to her younger siblings, and due to her love for the then newly published Harry Potter series, encouraged family and friends to read the stories as well. Throughout the years she loved the Babar stories, Amelia Bedelia and Babysitter’s Club series, and the fun Shel Silverstein poems. Works of non-fiction interested her as well, especially biographies and stories of children that lived in different countries. Claire’s spirit for fun, her passion for life and reading shine on in her tribute, Claire’s Day Inc., created in her honor by her loving family. The mission of Claire’s Day Inc. is to honor Claire Lynsey Rubini by inspiring children and families of all ages to be lifelong readers through exposure to a variety of literary opportunities and experiences. Claire’s Day Inc. was created in honor of Claire Lynsey Rubini, who died suddenly July 6, 2000, as a result of a heart condition. Claire’s parents, Brad and Julie Rubini, felt compelled to honor their ten-year-old daughter in a special tribute to her love of reading, storytelling, music, encouraging others to read and simply having fun with friends. Six months after Claire died, Julie came across an issue of Time magazine tucked in her plane seat pocket as they traveled to a family wedding. The magazine featured an article about Former First Lady Laura Bush’s involvement in the Texas Book Festival, which features Texas born authors and illustrators. Inspired by the story, Brad and Julie formed the organization in 2001. What began as a one-day free family book festival in 2002, has grown into a variety of literary experiences impacting over 15,000 children annually. Claire’s Day established an outreach program, the school visit program in 2004. Each of our visiting authors and illustrators are placed in schools who have partnered with Claire’s Day, offering their students the opportunity to hear their stories and inspirations. In 2016, the 15th anniversary of the festival, our 15 authors visited 43 schools throughout the greater Toledo area. Claire’s Night was also established in 2004. This fundraising reception offers adults the opportunity to mix and mingle with our guest artists and writers. After working in partnership for more than a year, Read for Literacy and Claire’s Day, Inc. formally entered into a merged and strategic alliance on April 1, 2015 at the Maumee Branch Library. This marks a new beginning for two stellar organizations. Going forward all programs and services of the merged organizations will remain intact. Read for Literacy will serve as the parent organization and Claire’s Day will become a signature line of service affording leadership stability and the promise of a new chapter in our shared story! We are especially grateful to the Toledo Community Foundation for the grant that allowed the organizations to identify the strategies that led to this merger agreement. We are also happy to report that Julie Rubini now has more time to write! Please visit her website at www.julierubini.com to learn more about Julie the author, philanthropist, city councilwoman and mom.